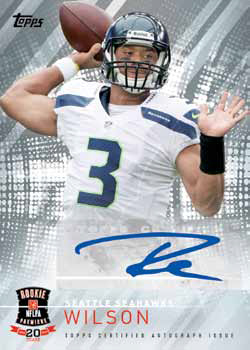 2014 Topps NFLPA Rookie Premiere has been cancelled. 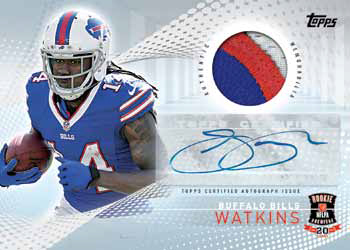 2014 Topps NFLPA Rookie Premiere Football looks back on two decades of the preseason event that puts first-year players in pro uniforms for one of the first times. The product comes with a different configuration than a lot of other releases. It comes in a single-pack box format that includes one autograph, 19 base cards and five parallels. 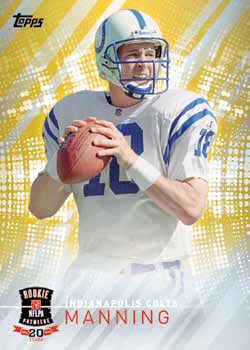 The 2014 Topps NFLPA Rookie Premiere Football base set has 100 cards. Thirty-seven 2014 rookie are joined by 63 players from past Rookie Premieres. Veterans and retired stars who moved on to other teams are pictured in their rookie uniforms. The base set has eight levels of numbered parallels: Black, Orange (#/299), Blue (#/199), Purple (#/99), Green (#/75), Yellow (#/50), Platinum (#/25) and Red (1/1). Autographs follow a similar pattern of past and present rookies. Cards use sticker signatures. Parallels include Purple (#/99), Green (#/75), Yellow (#/50), Platinum (#/25), and Red (1/1). 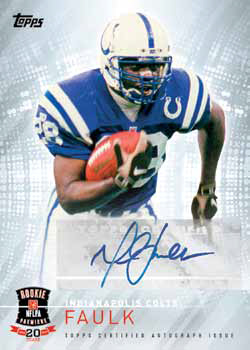 2014 Topps NFLPA Rookie Premiere has a few more high-end cards. Dual Autographs offer a combination of signatures. Autograph Relics are a case hit that have a patch swatch from a Rookie Premiere jersey. Red parallels are one-of-ones. 100 cards, including 37 rookies. 2014 BOWMAN CHROME BASEBALL HOBBY BOX - 2 Autographs per Box!